It only seems a few days since the summer holidays ended, but it’s not long until the clocks go back and coats and wellies become the norm. We hope our selection of activities inspires to get you out and about in Cornwall this October half term. Hallowe’en is ever more unavoidable and many activities have a spooky theme. We have tried our best to find a few non-Hallowe’en events for those of you with a less ghoulish nature. From Saturday 24 October to Sunday 1 November the Eden Project will be transformed into Halloweden. Children are invited on a mystical journey through the biomes on a quest to brew up a special potion. There will be owls from the Screech Owl Sanctuary, face painting, a carved pumpkin display, spooky shadow puppet plays and a “tunnel of terrors”. The Little Monsters’ Ball takes place from 6 to 9pm on 31 October. £7 per person. Fancy dress, creepy activities, tasty treats and a good boneshaking disco in the Olive Grooveyard. Eden’s hugely popular ice rink reopens for the winter on Saturday 17 October. See the full timetable for opening times. £6 per session, £4 to hire a penguin (for little learners). Parent and toddler sessions and Chilly Penguin sessions (for 6 to 12 year olds) highly recommended too. Book online. 3 to 5.30pm, Tuesday 27 October, learn to be a book illustrator with Judy Scrimshaw. Ages 7+, £12 with free copy of Judy’s book ‘The Ballad of Morgowr’ for every child. 3 to 5pm, Thursday 29 October, take part in The Big Draw. Ages 8+, free to attend. 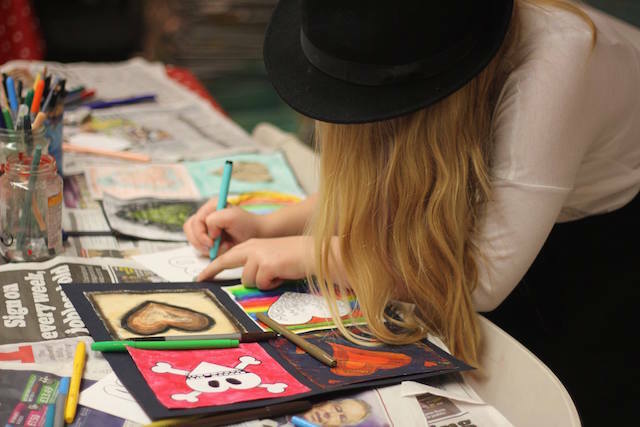 10 to 11.30am, Friday 30 October, design your own graffiti tag. Ages 7+, £7. 3.30 to 5pm, Saturday 31 October, make a lantern for trick or treating. Ages 5+, £6.50. Free face painting in the shop from 1.30pm. For food-loving 8 to 12 year olds, try the Children’s Hallowe’en Baking course on 29 October. Priced at £40 per child, they’ll be baking marshmallow witches’ hats and pumpkin cupcakes. Book online. Book a place at The Mexico Inn‘s (in Longrock, near Penzance) children’s cookery session at 10.30am on Saturday 31 October by phoning 01736 710625. Under the guidance of Lizzie’s Little Kitchen Magicians they will be making eerie eyes, broomsticks and carrot fingers. The Maritime Museum’s Hallowe’en trick or treat tour looks great fun. Children can make monster masks, badges and trick or treat baskets before setting off on a torchlit tour of the museum. Expect to discover ghosts and ghouls in the galleries and join in the creepy costume parade. 6.30-8.30pm, Friday 30 October. Tickets £5.95, suitable for ages 5 and up. Booking essential – phone 01326 214546. Between Saturday 24 and Saturday 31 October the Crealy Witch will be residing in her grotto, casting spells and giving a free gift to each child. There’ll be close encounters with the residents of Crocodile Corner Reptile House plus games, magic shows, face painting and colouring competitions. Every child will be given a free pumpkin for the chance to win a prize in the pumpkin carving competition. The park’s food outlets will be serving hot pumpkin soup, toffee apples and gingerbread biscuits throughout the week. If the sun comes out then book a last minute lesson at Watergate Bay with watersports experts The Extreme Academy. Individual and group lessons available, with surfing, SUP and kite surfing amongst others. Prices start at £25 for a two hour lesson. Open 9am to 5pm every day. Phone 01637 860840 for more information. The brilliant Rogue Theatre will be performing their Dead of Night Dance in Tehidy Woods. 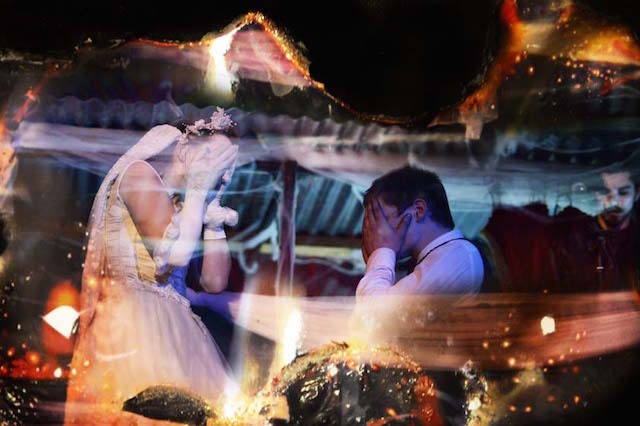 It’s a “theatrical Hallowe’en adventure for the zealously living and the rapturously dead spirits” designed for brave adventurers of all ages. Performances at 2pm, 5pm and 8pm every day from 27 October to 1 November. Full details and booking online. The third North Cornwall Book Festival takes place from 23-25 October in St Endellion. Friday 23 October has a special programme of events for children, with the Book Surfers and Bookworms schools sequences. There is also a series of events for children running alongside the adult ones all weekend, including sessions with Jill Murphy and Christopher William Hill. There will be a licensed bar and range of cakes, snacks, light meals and hot and cold drinks on sale and signed copies of books under discussion will be available at the onsite bookstall. Walk across the cobbled causeway or hop on a boat to explore St Michael’s Mount. The castle, shops and cafés are open Sunday to Friday (closed Saturday) until 1 November. All visits are dependent on weather and sea conditions. If in doubt, phone 01736 710507 or 01736 710265 to check conditions before you set off. For more details visit www.stmichaelsmount.co.uk. From 24 October to 1 November, Heligan’s magical and mysterious woods will play host to a spooky Hallowe’en Trail. Brave adventurers are challenged to creep along the trail and discover the spooky goings on. 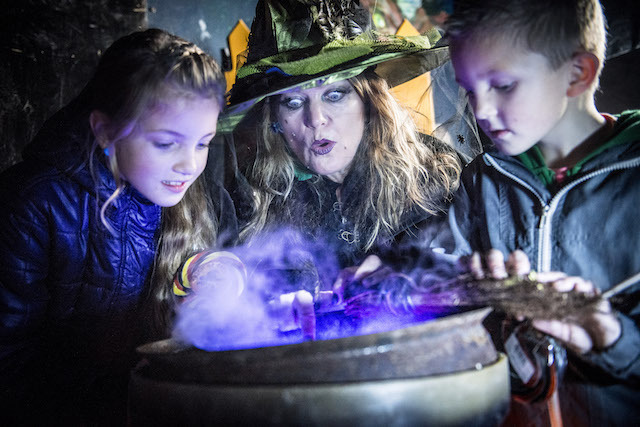 Listen to the story tellers’ enchanted tales around the fire in the Hallowe’en Yurt and take part in the spooky art activities in the craft tent – make a willow wand, a herbal dream pillow, draw with chalk and Heligan charcoal, or carve your own pumpkin. For full details, prices and times, visit heligan.com. I love Oliver Jeffers’ children’s books, and this exhibition for under 7’s looks gorgeous. Visitors can explore Jeffers’ beautiful and best-loved work, walking into immersive environments inspired by How to Catch a Star, Up and Down, Lost and Found and The Way Back Home. The exhibition is showing on various dates in the Avalon Theatre at Cornwall College in Pool until 13 December. £7 for adults, £5 for children. Book online. Follow the spooky trail around the garden at Lanhydrock, 10am to 4pm, 24 October to 1 November, £2 per child. Take part in Glendurgan Garden‘s wild art week, making a crown of autumn leaves or pebble picture at Durgan beach and explore the maze. Trelissick are running craft workshops from 11am to 4pm every day in half term, £3.50 per child. Follow the Tintagel Old Post Office‘s ultraviolet light trail, £2 per person, 11am to 3pm from 24 to 31 October. Make a home for a wild animal at Trerice, 12-3pm, 24 and 25 October, £2 each. Follow the pumpkin trail at Trengwainton, plus try apple bobbing and making your own toffee apples (at 11.30am and 2.30pm daily in the bookshop). Bring a torch for a self-guided spooky tour of Cotehele House, open 26 October to 1 November, 11am to 4pm. 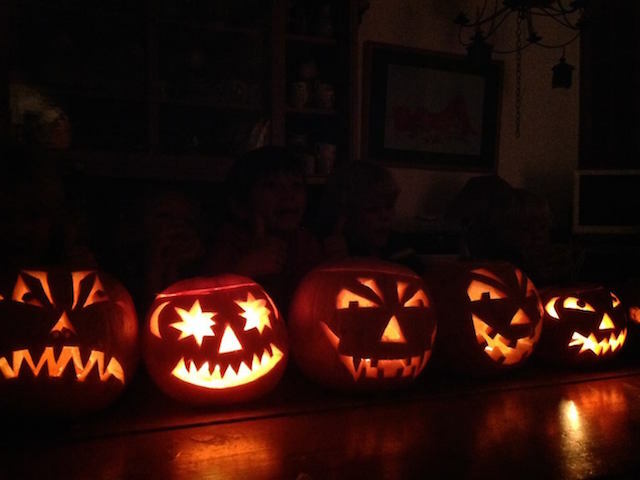 Trelissick‘s pumpkin carving workshop will run from 11am to 3pm on 30 and 31 October. £3.50 per pumpkin. Make your own bat box at Godolphin on 27 and 29 October, and listen to spooky stories, on the hour from 12 noon to 4pm on 28 and 30 October. Hunt for night time creatures on a twilight ramble at Antony House. Adults £8, children £6, includes hot chocolate and cake and lantern making activity for children. 6-8.30pm, Monday 26 October. Booking Essential, phone 01752 812191. Check out our other blog posts: The October Foodie Diary and Top Ten Cornish Restaurants for Kids. Let us know about other exciting events by posting in the comments section below.